Social media is drawing a lot of attention this year for holiday shoppers, with a major increase in Canadian consumers using Instagram and other social media platforms to make purchasing decisions, according to a survey from Accenture. 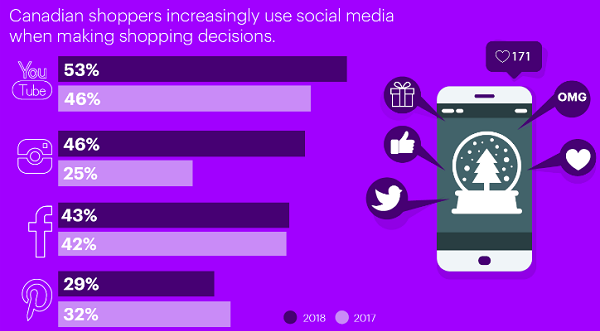 The annual Holiday Shopping Survey from Accenture found this year that the percentage of shoppers planning to use social media is on the rise, with 46 per cent of people planning to use only Instagram for their online shopping and another 53 per cent planning to use Youtube to make shopping decisions. “The use of social media, in general, is increasing, with 37 per cent of shoppers saying social media will make their shopping easier when buying for people not normally on their list, up from 30 per cent in 2017,” stated the report. 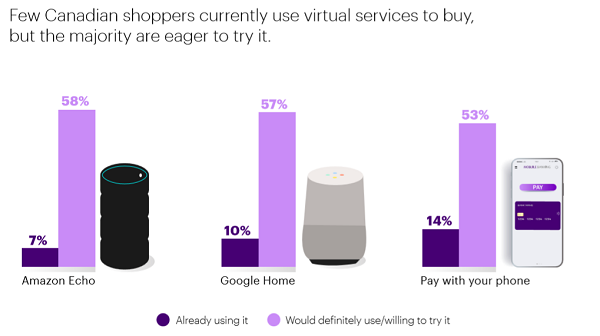 Another trend for holiday shoppers is a growing interest in using smart home devices and making purchases without having to lift a finger. However, with the increasing reliance on digital shopping for these consumer holidays, security is a major concern. Two-thirds of the survey respondents shared concerns about the security of personal information when online shopping, with at least 44 per cent stating they plan to take protective measures and avoid brands that have been involved in recent data or security breaches. According to the survey four out of 10 shoppers said they do not have plans to shop on Black Friday, and while that may seem significant, that means more than 60 per cent of Canadians are still interested in finding bargains. However, the survey found that consumers prefer to shop year round and take advantage of ongoing online sales and events like Amazon Prime Day for holiday shopping needs. Of those still planning to shop, they will spend more than last year, claims the Accenture survey. Canadians on average will spend $733 on gifts this year versus $648 last year. But they aren’t just shopping anywhere. “Shoppers intend to make their gift purchases at Canadian retailers rather than travel to the United States or shop with U.S. online retailers,” siad Accenture. Consumers also prefer businesses that are socially-conscious. More than more than 54 per cent of those surveyed plan to make purchases with brands that reflect their personal values. Reflecting that desire for social responsibility is the fact that #GivingTuesday has been a big topic of discussion on Twitter according to findings from Salesforce’s Social Studio. “#GivingTuesday is the second most used hashtag in conversations about Black Friday in Canada,” states the Salesforce report. “If retailers are able to make some effort to incorporate diversity and inclusion into how they conduct business, Canadians will take notice,” Kelly Askew, managing director at Accenture Strategy said in the release.